An argument put forward to support the authority of “the” Septuagint is the fact that “the” Septuagint contains Psalm 151. This argument is mainly used by the Eastern Orthodox churches who include this Psalm as part of their Canon, unlike most western churches who do not. The Hebrew Bible, like most English language Bibles do not include Psalm 151. They stop at Psalm 150. When the dead sea scrolls were discovered, amongst the scrolls was scroll 11Q5/11QPs-a. It contained a Hebrew version of the 151st psalm. Until this time the Psalm had only been known via the Septuagint, the latin and the Syriac. It was believed that the verse was a Greek composite. So with the discovery of the Psalm in Hebrew it is now starting to be accepted that the verse was in fact not Greek in origin but Hebrew after all. This all sounds pretty reasonable. However before we jump to conclusions and say the verse is authenticated via the dead sea scroll, there is rather a bit more information that we must also take into consideration. Obviously we have the fact that NO Hebrew manuscript anywhere else in the world apart from this one manuscript contains the Psalm. NO Hebrew Bible anywhere in the world contains this Psalm. It therefore must already be believed that the Greek does or could supersede the Hebrew for this to even start to be authoritative. The dead sea scrolls also include 9 more Psalms that are not included in the Septuagint. There are a total of 160 Psalms included in the dead sea scroll. 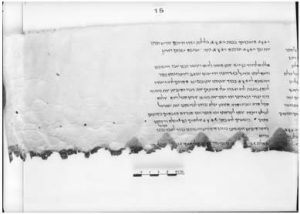 If we are going to argue for the authority of Psalm 151 because of the dead sea scroll then it stands to reason, to remain consistent that it should also be argued that the other 9 psalms are authoritative and should be included in the Bible as well. It therefore needs to be asked why the authority of these 9 Psalms is not also being argued and why the Orthodox church has not added them based on the new information. “This Psalm is ascribed to David and is outside the number. When he slew Goliath in single combat“. This simply means that even the Septuagint that included the verse did not consider it as part of the authoritative Psalms. It was outside the number of authoritative Psalms. The text of the dead sea scrolls is rather different from the text contained within “the” Septuagint Or in other words the Hebrew is rather different than the Greek. The Psalm in the Septuagint is just one composition, however the Psalm in the dead sea scrolls is actually in 2 parts. Psalm 151a and Psalm 151b. The translator(s) of “the” Septuagint has very clearly merged the two Palms together and changed the wording and order considerably, leaving out much. The fact is the meaning of the Psalm through the changes to the text, has changed as well. The versions not only differ in structure and length but also in their meaning. Psalm 151 dead sea scrolls. Psalm 151 (a+b) are the ONLY Psalms that are considered autobiographical. This is unique and while can‘t definitively disprove the authenticity, it most certainly can be argued that this Psalm does not “fit” as a Psalm. But rather a later addition to the Psalms. Below is a translation of both the Dead sea Scroll and the Greek Septuagint. The differences between the 2 plentify are clear. Hallelujah! A Psalm of David, son of Jesse. This psalm is autographical, ascribed to David (but outside the number), after he had fought with Goliath in single combat. and ruler over his little goats. I would shepherd my father’s sheep. and so I gave glory to the LORD. my Lord? The Lord himself; it is he who hears. and who can recount my deeds? the God of everything has heard, and he has paid attention. Samuel to raise me up. handsome of figure, handsome in appearance. the LORD God did not choose them. and ruler over the sons of his covenant. after God’s prophet had anointed him. 4c and anointed me with his anointing oil. and tall, but the Lord was not pleased with them. and took away disgrace from the people of Israel. throwing out taunts from the r[anks of the enemy]. Verses 1-5 are from Psalm A while verses 6 and 7 are from B. B is only partially preserved. The dead sea scroll is dated as 1st century AD. This is some 250-350 years AFTER the supposed Septuagint was compiled. While Psalm 151 is very clearly included in the scroll there is actual no evidence that it is in any way authoritative. Those that simply say that the finding of the Psalm proves the authority of the Septuagint or at least supports the authority of said version are not offering the full facts. It is only when we ignore the evidence presented here that a positive case can be made. When we take all the evidence into account. The authority of the verse is simply not so clear and I would say rather unlikely. There are simply too many inconsistencies and the evidence would point away from its authority.